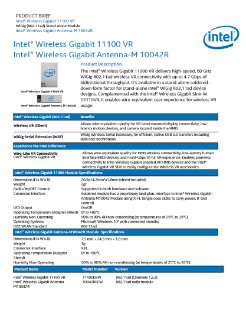 The Intel® Wireless Gigabit 11000 VR delivers high-speed, 60 GHz WiGig 802.11ad wireless VR connectivity with up to 4.7 Gbps of bidirectional throughput. It's available in a stand-alone soldered-down form factor for stand-alone Intel® WiGig 802.11ad device designs. Complemented with the Intel® Wireless Gigabit Sink-W 13110VR, it enables wire-equivalent user experience for wireless VR usage.